We understand the excitement as well as the worries of soon-to-be mothers out there. This maternity belt is here to help make pregnancy easier. We are committed to the highest standards of craftsmanship with the customers welfare in mind. We know that as the pregnancy advances, mothers have to deal with the strain of a growing uterus and excessive weight gain that can increase hip instability and abdominal separation. This belly band provides back support and helps lift the pregnant tummy to minimize the pulling forward and down of your belly, which often causes back pain. It effectively redistributes the weight of your pregnancy and helps make your back feel better. We would like to help pregnant women address common pains and soreness during pregnancy but please note that maternity belts are not intended to alleviate underlying medical issues. This maternity belt helps ease the discomfort of pregnancy. You will notice an instant relieft from back hp and pelvic pain. It's great way to correct your posture and support weak abdominal muscles during your pregnancy. Also a perfect gift for mother to be, they really need more care. 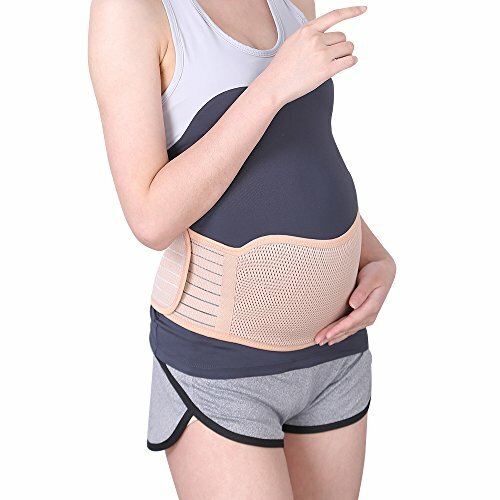 The special design of the pregnancy belly belt gives you strong support for your belly, waist, hips, back and pelvic bone, hold your stomach firm in place during your pregnancy. You will be able to bend, sit and walk with ease during pregnancy. The maternity belt made of breathable mesh material, good elasticity, it can be worn daily during your day to day activities, you don't have to limit your abilities while wearing this pregnancy belt. It's also can be comfortably worn under any clothing. One size, excellent strencthy elastic, it is able to strech to your desired size, no need to worry about size anymore. You will be able to wear this belly brace throughout your entire pregnancy. Prefer to hand wash. Or machine wash separately, it becauses the belt has strong Vercro on, to avoid the hook damaged your other clothes. If you have any questions about this product by Sanky, contact us by completing and submitting the form below. If you are looking for a specif part number, please include it with your message.